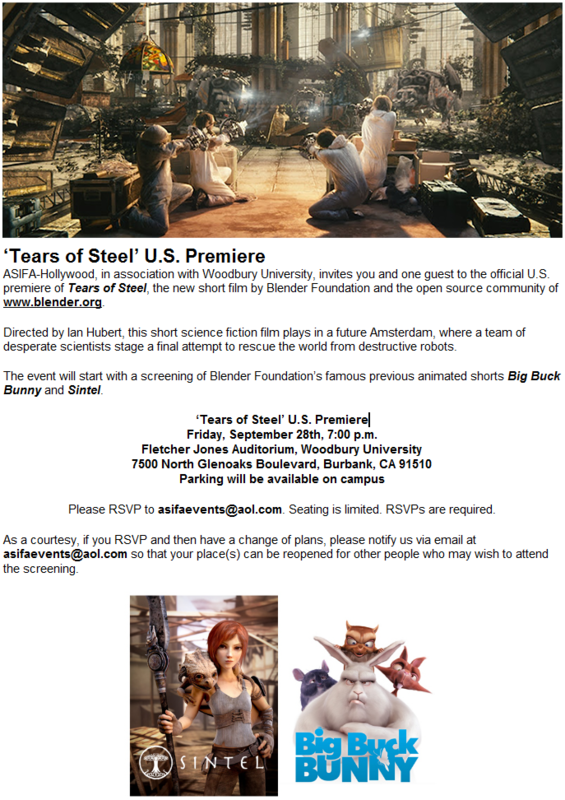 ASIFA-Hollywood – the society of animation studios, including Pixar, Dreamworks, Weta, and so on – will organize and host a special screening event with three of our movie shorts – including the official premiere of Tears of Steel. We’re very proud! After the screening, the audience will participate in a Q&A session with Ian Hubert (via Skype). Click on the image to the right to read the full invitation. Or check the official announcement. Special thanks to Arno Kroner for helping to get this realized. Next week friday, don’t miss this – if you’re in LA! Great news, and a great place for the premiere. I wish you good luck and a lot of fun down there! Congratulations, I’m really proud be part of the Blender Community. Great stuff, well done chaps! Cool, is that the same day tears of steel comes out on the web? I haven’t been able to confirm the date and time- I hope its right. All information should be update now. I re-uploaded the invitation, and added link to ASIFA website with announcement.